P1020522, originally uploaded by rogercarr. I attended a wedding this past weekend. 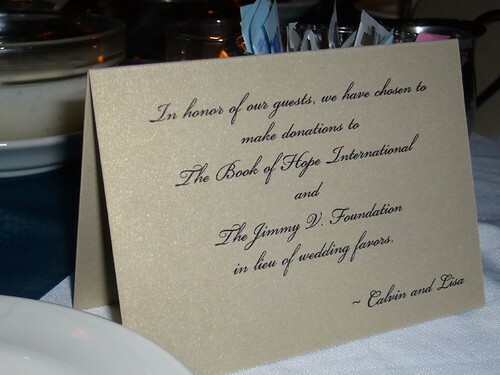 This note was displayed on each table at the wedding reception. If You Didn't Exist, What Good Things Would Not Have Happened? Kivi Leroux Miller and Claire Meyerhoff have started a new show on BlogTalkRadio called Magic Keys Radio. The purpose of the show is to unlock the secrets of nonprofit marketing and fundraising. I have been a fan of Kivi's nonprofit work for some time, so my expectations for Magic Keys Radio is high. "If your organization didn't exist, what good things would not have happened?" Nonprofit organizations should be asking this question on a regular basis. Not just when the annual report needs to be produced. Also, the question shouldn't be limited to nonprofit organizations. You and I should frequently ask this question about ourselves. "If I didn't exist, what good things would not have happened?" If we don't have a good answer to this question, then it is time to get realigned with our purpose and take action to make the world a better place. I had the privilege of being chosen as a guest blogger for the Charity Mile Blog. My first blog post is a description of the 2008 Fredericksburg Arthritis Walk that took place in Fredericksburg, Virginia. Several Everyday Giving Blog readers made donations during my personal fundraising efforts in support of the event and the Arthritis Foundation. Thank you for supporting me and the critical efforts of the Arthritis Foundation. Be sure to click here and check out the article. 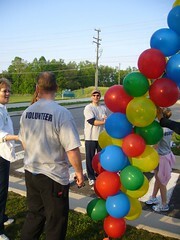 If you have an interest in Charity Walk, Run or Bike Events, CharityMile.com is a great resource.